Visiting from theUK for a few days and wanted to find a .Traditional Dutch restaurant. This place is truly a gem. We were made to feel really welcome , the food was delicious and the staff very attentive. Had a great evening. Lovely Dutch food and hospitality in small family friendly restaurant. We tried La Falote based on the recommendation of a friend. Our dining experience was terrific. Food was great and the staff was attentive & charming. Price was very reasonable. The service was exceptional and the food was very flavorful. We recommend this restaurant. the service from the 2 young ladies was very kind and very fast! Nice cosy restaurant. Good simple, traditional food and suggestion of the day that make choosing even easier. Fake mood , very profesianal way to sell traditional mood. The food was very nice but the bill was very expensive. If you go , be prepared to pay everything extra . The service is wonderfully friendly. The specials were particularly tasty and good value for money. The restaurant has a cozy, family, neighborhood feel to it with Dutch specialities on the menu. Very nice dutch restaurant. The waitress was smiling and patient with us. bij dit restaurant is alles prima in orde! 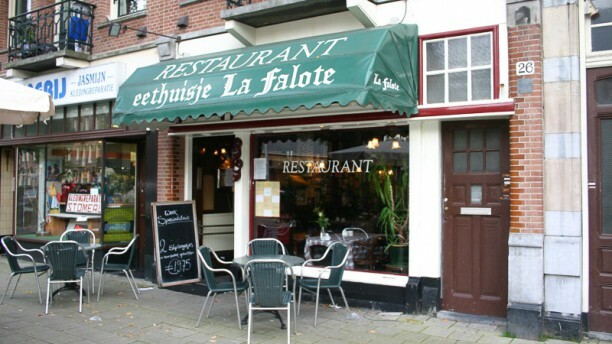 We ate at La Falote twice during our holiday in Amsterdam. The food was really delicious but it was the service that made us return the second time. There was always a smile on everyone's face and the staff made you feel like you were family. When the head chef came out and started playing the accordion, it made the night even that more special.